Click on the play button to launch the Choir’s 24/7 music stream. 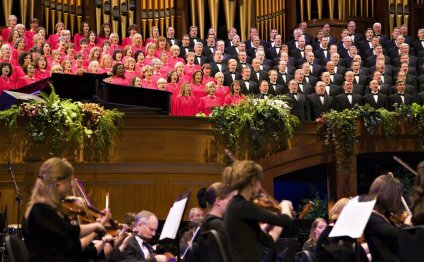 Once the player is opened, the music of the Mormon Tabernacle Choir and Orchestra at Temple Square will continue playing until you press stop or close the player. The player keeps playing even if you close the website page view. Another music listening option is the General Conference Choir music archive. This allows you to choose a specific song to play from those performed by the Choir in the Church's semi-annual general conferences. The 24/7 music player shows features a volume icon at the top of the player for easy volume control. Just click the icon and slide the volume to your desired listening level. There is a ‘Buy Now’ option underneath the song title which takes you to the Choir’s website for purchasing options. For convenience, there is also an ‘up next’ feature so you can see what song is coming next.